Aqua Boy was built on several core values, commitment to excellence, dependability and honesty.We love what we do. We love to clean and see the results! Our success comes from exceeding the expectation of our residential customers, as well as our commercial clients. 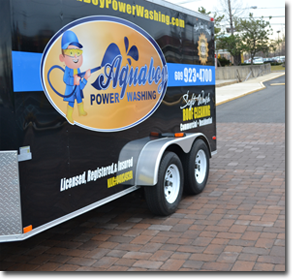 Aqua Boy Power Washing is New Jersey’s premiere Power Washing Company. 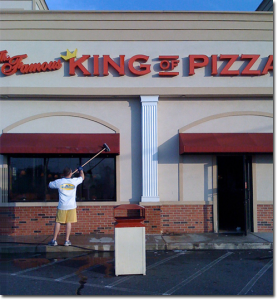 Our purpose is to be successful while developing a sound reputation within the power washing industry. How can this be achieved? Aqua Boy Power Washing relationships are as important as the work we perform. We strive to continue our professional relationship well after the job is complete. Each satisfied customer is an asset to our business, maintaining that relationship only strengthens our vision and reinforces the commitment to the service we provide. Protecting our reputation is vital and this can only be achieved through maintaining excellent service. Aqua Boy Power Washing will take the time to explain any services we perform and offer the most effective and affordable solution. We will never ask for payment until your service is complete and you are fully satisfied with the work we’ve completed. From the start to finish we will follow OSHA guidelines on safety. Feel confident knowing we are licensed and fully insured.Aqua Boy Power Washing brings state of the art equipment to perform the smallest to largest of jobs. We pledge to bring the very best results in any cleaning application we perform, in order to do that we need the right tools. Our machines, equipment and chemicals selected have been studied over and tested, so we may bring about the highest quality of workmanship. Our hot water machines combined with the biodegradable cleansers are designed to not only remove mold, mildew and algae growth, but also deter its future growth. We take a great deal of pride when safeguarding your flowers, plants, lawn and shrubs from damage. With our soft wash application for residential cleaning to our commercial / industrial cleaning we come prepared and will deliver the results you expect. Knowing your house is your single largest investment, Aqua Boy realized from the start we must invest in quality equipment. In todays market it would appear that everyone offers Power Washing as an extra add on to their business: the painters, landscapers, handyman services etc. The misconception is that anyone can start a professional Power Washing Business with a little start up money. My professional advice to any homeowner or business owner would be don’t let price be your only consideration for hiring someone to clean your property. Request to see the equipment, proof of insurance and proper licensing before hiring someone to power wash and ask lots of questions regarding the cleaning process. Questions such as “how long does this process take, does your company use hot water when cleaning, will you safe guard my flowers, shrubs, lawn and trees?” These are extremely important things to inquire about. Asking questions like these will only protect your largest investment and give you the peace of mind that you’ve hired a true professional to Power Wash.
Aqua Boy Power Washing LLC would be glad to do all the above requests and give a free estimate on any job you desire. We guarantee all our work and look forward to hearing from you!